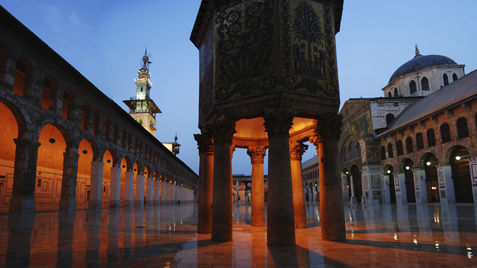 The courtyard of the Umayyad Mosque in Damascus, Syria, where Ibn ‘Asakir preached his book on jihad. Smith Professor Suleiman Mourad believes that efforts to cast jihad as a spiritual rather than as a concrete directive to further Islam are simply at odds with how many practitioners of the faith understand it. Growing up in Beirut, Lebanon, Professor of Religion Suleiman A. Mourad saw, at an early age, civil war being fought in the name of religion and jihad. Now he wants to expose how jihad, a much talked about and widely invoked concept in Islam, has been reinterpreted and corrupted over the course of nearly a millennium. As a scholar, Mourad believes that he has an obligation to explore the origins of today’s concepts and that understanding history is essential to efforts aimed at reinterpreting religious doctrine. 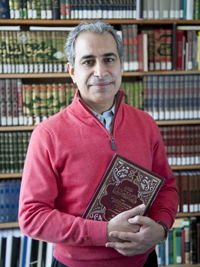 Politically correct scholars tend to downplay the stridency behind the obligation some Muslims feel to fight in the name of their religion, according to Mourad. Efforts to cast jihad as a spiritual rather than as a concrete directive to further Islam are simply at odds with how many practitioners of the faith understand it. In a forthcoming book, The Radicalization of Sunni Jihad Ideology in the Crusader Period (to be published by Ashgate Press), Mourad and co-author James E. Lindsay of Colorado State University grapple with the question of how the concept of jihad came to legitimize Muslims fighting other Muslims, something proscribed as sinful in the early Islamic tradition. Their starting point was a fairly obscure work by an otherwise prominent 12th- century scholar. Ibn ‘Asakir is famous for his 80-volume history of Damascus, an encyclopedic tome that, bound in bright red, holds a place of prominence at eye level on Mourad’s bookcase. Writing a few decades after the first European Crusades that descended on the Holy Lands, Ibn ‘Asakir was a preeminent authority on Islam in his day. 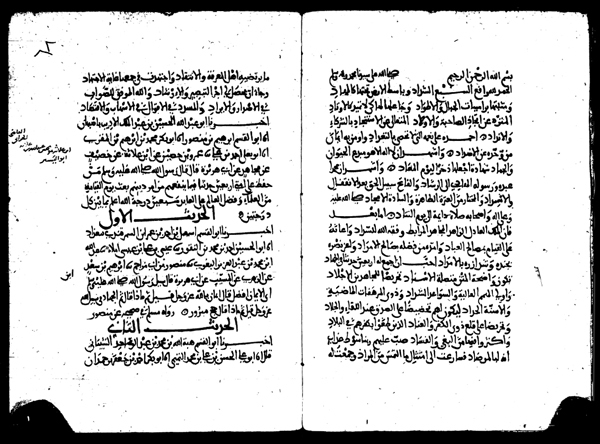 Ibn ‘Asakir’s lesser-known work, which Mourad went to Damascus to read, was called Forty Hadiths Inciting Jihad. Hadiths, explains Mourad, are stories about the words and actions of the Prophet Muhammad. They are pored over as crucial complementary religious sources to the Qur’an and are in many ways considered to be even more important than the holy text itself in providing guidance to followers. 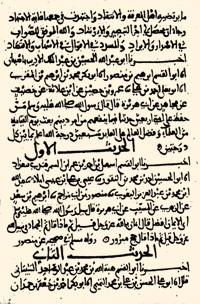 The first page of Ibn ‘Asakir’s The Forty Hadith for Inciting Jihad, from the unique manuscript that is preserved in the public library in Damascus. Click to enlarge. Mourad sees politics at play in Ibn ‘Asakir’s work. “We are not talking about simply someone being an important scholar,” said Mourad. “He was also a key adviser to the ruler of Syria at the time.” That potentate, Nur ad-Din, was followed by his protégé Saladin, whose campaigns against the crusaders are seen as a turning point in the history of Islam. Mourad and Lindsay follow Ibn ‘Asakir’s interpretations of jihad forward to contemporary thought. “When you start looking,” says Mourad, “you realize that this book had a tremendous impact on a large group of Sunni scholars.” This means that anyone looking for what Mourad calls a “legitimization of militant jihad” will easily find it in today’s mainstream literature. Mourad says that the crusaders are never mentioned in Ibn ‘Asakir’s writings on the Hadiths relating to jihad. The context was that his political patron wanted to make peace with the crusaders in order to focus on fighting Shiite Muslims who had established a dynasty in Egypt. In a forthcoming book, Smith Professor Suleiman Mourad and co-author James E. Lindsay grapple with the question of how the concept of jihad came to legitimize Muslims fighting other Muslims, something proscribed as sinful in the early Islamic tradition. A secular Muslim, Professor Suleiman Mourad attributes his own attitudes toward religion to his upbringing in Lebanon during a religiously based civil war. “I saw how much hate religion can lead to,” he says. The message for him was that ideas about religion have a deep impact on how people treat each other. Many factors, such as poverty and competition for resources, lead to fighting, he says. But people naturally coalesce around groups, and religion is often used to categorize people into friends and enemies, he continues. “We need to take religion seriously in how we engage world problems, especially in those societies where religion is key to social life,” Mourad explains. And for religion to be a positive force for change, which it certainly can be, practitioners have to admit that religion also inspires violence, and this is a problem that must be acknowledged and addressed.